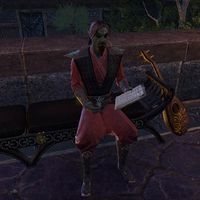 Ivulen Andromo is a Dunmer scholar who can be found in the Saint Olms Waistworks in Vivec City. He sits on the north side of the walkway above the central plaza. He was researching the Salothan Tomb when the dead awoke and chased him away, leading him to petition the Hall of Justice for help. "Bit busy. Can't talk. Ta-ta." "I hate the city. So much damned noise! How am I supposed to get any writing done with people like you coming and going at all hours?" I'm here about the job you posted. "I thought the matter fairly straightforward. Spirits risen, terrorizing decent living folk with important research to finish. I don't care if it is their tomb, get rid of them!" What can I expect to face at the Salothan tomb? "I didn't stop to take a census as I was fleeing for my life. Suffice to say that the wraiths and skeletons will be the least of your problems. Those wretched Salothans have a veritable army haunting the place." Why so interested in a haunted tomb? "The entire Salothan lineage died out in a monumental battle, yet they are barely a footnote in history. One does not secure a coveted historian role in the Temple by ambling along well-trod ground. I must uncover their lost past!" If it's their tomb, don't they belong there?/Aren't the spirits of historic significance as well? "These aren't the benevolent ancestor spirits you may have heard of, Outlander. They're mad, or cursed, or both. I would love to hear of their lives in their own words, but that's proven impossible. They must go!" "I sincerely hope you haven't come to bother me with more questions." No, I'm here to tell you that the Salothan ghosts have been laid to rest. "Oh, well, that's another matter entirely. Why didn't you just say so? So much to do, I need to prepare for the journey! Ah, here's your pay. Goodbye." "Did I neglect to pay you ...? No, I made a note of it right here. I have no further business with you and much to do. Off you go!" This page was last modified on 11 February 2019, at 00:40.